I feel I should let you all know that the oven is back in business. I think she still needs some attention, but she'll get that in due course. Thank you for the well wishes. Nice to know the world cares about my range. Now, I haven't got a lot to blog about right now. I wasn't able to cook much before leaving on this trip, and it was too nice outside to worry about cooking anyway (said the man who actively avoids physical exertion whenever possible), but I do have one or two things tucked away up my sleeve, which, in the absence of anything better, are going to get their time in the Delicious Delicious Delicious limelight anyway. 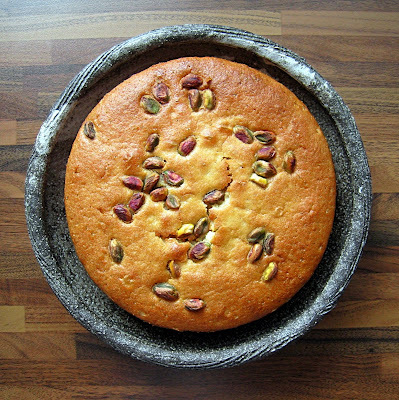 First up is this orange, olive oil and pistachio cake. It's dairy-free, so bang on trend, and certain to find favour with the 'Free From' set. Or those with 'Middle Class Allergies', as Mr. Other P puts it. I find that I don't buy so many cookbooks these days. It's a conscious thing; I'm running out of bookshelves, and can't really justify the expense of another book that I won't cook from. So I am making the effort to make dishes from tomes I already own, and recently, it's been Tessa Kiros who's provided the blueprints. Her books are beautiful, but I have made scarcely a handful of her dishes. It had to end. It is ending. That said, her original cake recipe, from Apples for Jam, didn't quite do it for me. She wanted me to use pine nuts. That put me in a pickle. Do you know how expensive they are? Does Tessa know? Well? I can't, won't, justify that sort of money, and besides, even if I had a load of pine nuts in the cupboard, they would be for pesto, not cake. So I've taken the decision to use pistachios instead, and am fine with it. I can only hope Tessa is too. I have increased the amount of sugar and orange zest in the recipe, too, so really it's not even Tessa's anymore. But it is amazing, and you must make it. Especially because it yields two, moist, orangey and Summer-scented, light brown sponges. Yup: it is that good. Go get your whisk, and I'll see you back here in five. Pre-heat the oven to 180 C. Grease and line two 20cm round cake tins. Whisk the egg whites until stiff peaks form. Beat the egg yolks with the sugar and vanilla until creamy, and gradually whisk in the oil, until you have a smooth emulsion. This takes about two minutes with an electric whisk. Fold in the flour and baking powder, then stir in the juice and zest. Finally, fold in the egg whites. Pour the mixture into the two tins, sprinkle with the nuts and bake for about 30 minutes or until done. my word Mr P... this looks outstanding and just the perfect thing for next weekend... thanks for the recipe. I'm excited that your oven is fixed... This idea is super. I think orange and pistachio go together waaay better than orange and pine nuts do. I must banish the eggs from the recipe (sorry other Mr. P) but it's not going to matter. Not a chance with orange and pistachio cake. Dear God! I NEED some of that! Wow that sounds really great and looks delicious! There is something so bsic and comforting about this cake. Appeals to all the senses. Real neat! Funny you think of your oven as a she, mine is a he. I love your blog, recently discovered. You know, I think this is a really Italian cake, but I don't think they actually make cakes with olive oil here. Whatever; delicious. this is truly delicious delicious delicious! I have got to make it! Your photo makes this look too beautiful to slice into. And I would take pistachios over pine nuts any day! Oh man this sounds lovely, it reminds me a bit of a Harry Eastwood cake I made last year with polenta and citrus. Yours is way prettier though and I'm glad your oven is ok now! If only you lived in America where at a Costco, you can buy a 50 pound jar of pine nuts for $10. Okay, so maybe not a 50 pound jar, but at least a 2 pound jar. That's the way the wholesale clubs roll. What a lovely cake - it would be oerfect for a firend of mine with "middle class allergies". I have Apples for Jam too (a beautiful book), but I think I've only made one thing out of it. I made this a while back and remember loving it too! I'll go hunt the book now... Thanks! This looks just awesome. I've got to make me some! Bookmarked! I need to make this beauty soon! Its delicious, delicious, delicious looking! I really should try this one. Simple yet delicious. I have always loved pistachios!